In later stages of the T-800 infiltrators program, Skynet realized that the endoskeletons lack certain grace of movements which humans poses. The infiltrators looked human (suspiciously well fed, though), but their stiff hips and overall heaviness gave them away. 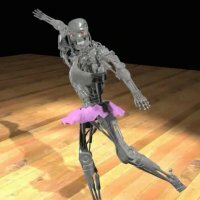 To remedy this problem, Skynet added dance classes to T-800's training routine. As a result, a new series was introduced, with improved motoric functions and a chassis made from lighter alloy, finally capable of elegant motion. Tango proved to be the most efficient dance for proprioception system calibration, hence the series name: Tango-800. 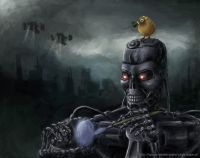 Terminators have inhuman strength, but they can be pretty delicate if need be. To calibrate high resolution touch sensors, each newly assembled unit needs to paint an Easter egg. Those T-800s which are not able to complete this task without breaking the egg are rejected by quality assurance. 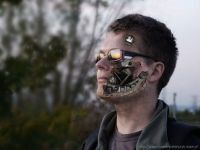 Terminator effect photo manipulation. Every terminator fan needs to have one, so here it is. The inspiration was the source photo itself, I already look like a terminator (well, as close to it as I ever will). For best viewing experience, see it on youtube. 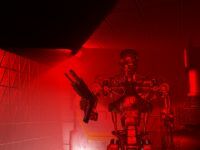 A 6 second clip where terminator gets hit with a plasma projectile in a head. The animation is lousy (only the head is moving, which looks pretty awkward), because it was supposed to be only a generic VFX test. I'm pretty pleased with the result, so I added sound and background and decided to publish it. Me and Terminator drinking cheap polish wine in my kitchen. A one minute long film, where Aerial Hunter Killer leaves it's underground dock. Sound special effects are from internet sound banks, music is taken from Terminator II. It may not look like it, but it took me 5 months to finish it. 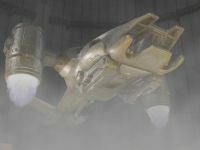 A short animation with terminator standing on guard in a foggy environment. 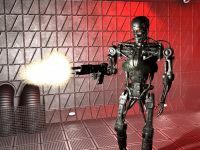 Terminator walks through an airlock in a futuristic corridor and starts shooting. Don't ask for a reason. This is my first movie with sound. 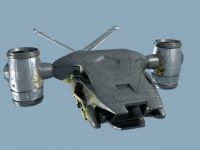 Aerial HK- Model A4 Type 400c Series 400, modeled as close to the original design as I could. Plays the main role in The Dock movie. 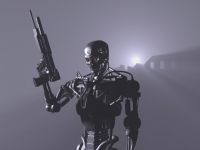 After my terminator was connected to Character Studio biped skeleton, new possibilities opened - I could download any motion capture motion and make the model follow it. Pink skirt was animated with Reactor. Ruined street in a post nuclear city. 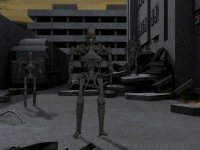 I had very ambitious plans - the street was supposed to be full of terminators and AHK's flying above, looking for resistance members in the ruins. I also wanted to use global illumination for the frist time. Unfortunately such a movie has proven to be way to much, for me and for my computers. So you can only see some try-outs here.